So, haven't been at home much. Working all the time, in my wonderful job at Organic Good Food Store. Now, I love my job. I love my co-workers. what I don't love is developing tendonitis in my right arm from repetitive stress. that's right people. the bane of knitters and spinners everywhere is coming to a woolfreak near you. In happier news, today I got a bunch of packages. I received four pairs of shoes, which I will supply pictures of. My order from knitpicks; yarn, arctic lace book, and harmony wood options! I also got a rather mysterious package from my $60 swap pal from Fiber Frenzy. There wasn't a note inside, so I wonder if it's supposed to come with another package? In it was some tweedy yellow wool, and some really nice babydoll southdown sheep fleece. Pictures coming soon, for all you drive-by bloggers out there! I finally got around to taking pictures of the new Humble Abode. Sorry, I haven't had much creative force in the fibre front, but I'm working towards it. Max is here now, and terrorizing the dog, as was to be expected. He happens to be selectively evil. Onto the Kitchen (my favorite room). Everything in my house is a weird 2/3 size. stove, fridge....bathtub. Perhaps I shall show you my hilarious bathtub next week. I scored this table and chair set while garage sailing. So far it has served me well, and I do love it dearly. My living room, with it's cunningly concealed television and books. And part of the bedroom. the other part is too disastrous to show. It's very orange for a bedroom. A pie for all seasons (except late winter, spring and summer). Last Sunday here in Canada it was Thanksgiving. I know Americans all have it in November because my stepfather is american. in order to transition him to canadian customs, we had two thanksgiving a year for a while. here's a play by play (sort of) of my pie making adventure this year. First I scooped out the pumpkin innards. Then I baked the pumpkin (no photo). Then I put the baked mushy pumpkin into the food processor, quarter by quarter, until it was all mush (fairly self explanatory). After that In went the sugar, spices and eggs. There's something special about whipping cream. The way it makes everything better. Like chocolate. Or chocolate with whipping cream. One 7 lb pumpkin will make three pies. And distract you from your knitting for all of one evening. The next you'll also be distracted by all the food. I got me a package from my Fibre Frenzy Handspun Yarn pal Theresa. It's awe-inspiring. Truly. It had Green Tea. Full view includes the piece de resistance; autumn coloured alpaca yarn. Theresa is a very very talented spinner, and I'm thinking a colourwork tam may be the order of the day. Also, chocolate, Yak Down (the brown stuff) Mohair from a green goat, and all these little white things that rattled. I couldn't tell for the life of my what they were (alpaca girl that I am), so I opened one. So we're having a contest in my group, and it says flash your stash. Okay, I was also going to post pictures of my brand new place of living....but fell asleep after an insane workweek instead. So here's some not quite so recent pictures of the stash. 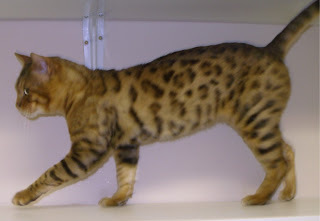 He's a 2 year old retired bengal cat, and he'll be flying in from alberta mid-october. Coda and I are both very excited for his arrival! So I get the box in the mail. From the outside you wouldn't think it was an especially extraordinary box. But you'd be oh so wrong. Behold, all the wonders bestowed upon me by the lovely, the miraculous, Donna! Full view with extras of salt scrub (silver thing) and the Dyer's Garden book, which I have been coveting for who knows how long. Also, a wonderful bag Donna made for me, with wool she dyed herself. I've been using it to carry knitting, and totally love the alpaca. And not shown here, but so very very much appreciated, were blocking wires from knitpicks! The mailperson (to be pc) hid them from me among the boxes in the carport, so the pleasure was slightly delayed. I can block my shawls properly now! I'm not sure anyone's ever spun me a better daydream than this! I live in Nelson, my now-reclaimed hometown. I spend my days as an employee of our local health food co-op, and dance my nights away. In between I spin, knit, and may even find the time to learn to use my loom one of these days. Other callings include a neurotic dog, a suspicious horse, a miniature leopard, and a curious boa constrictor. Plus two giant spiders and a houseful of smaller ones. If Wishes Were Fishes, We Would Walk On The Sea.